Even now it is difficult to picture a motorcycle factory in Billericay and in 1918, when Reginald Weatherell came to the town, it must have been even harder. But he did come to Billericay to manufacture motorcycles. His factory was soon producing a range of machines, including racing models. His was a brave, but short-lived, attempt to produce motorcycles. Reginald Weatherell was born in Hunslet, now a suburb of Leeds, in 1896. Even before leaving school he had become interested in motoring owning an elderly De-Dion by the age of 13. On this early vehicle he learnt to drive and, no doubt, carried out his first repairs and alterations. His first job was with a large engineering concern in the north of England. Here he was an engineering apprentice working on motorboats and motor vehicles, fostering his interest in mechanised transport. He remained there until 1915 when he became attached to the army, working on the continent maintaining the thousands of motorcycles used by the services in this conflict. Following the armistice he moved to Billericay where he established Billericay Garage and Motor Works. This small workshop and second-hand car business was situated behind 62-64 High Street, a cycle shop then owned and run by Robert Larritt. Access to Weatherell’s extensive yard and outbuildings was through the shop, or by way of Chapel Street. Here he soon became an Automobile Association road agent and a repairer for the Royal Automobile Club. Our young entrepreneur could no doubt have remained here, but his ambition was to manufacture a motorcycle of his own design. He kept working towards this end and by July 1919 he had erected a small bungalow and workshop on two adjacent plots of land he had purchased in South Green. This was then a small community about a mile from Billericay separated by the fields of small farms which have now been developed or become part of Mill Meadows. Most of his life savings of about £2000 and the proceeds from selling his two cars were invested in the project. His motorcycle works and bungalow stood on the corner of Southend Road and Outwood Common Road. A sheltered housing complex, Allington Court, now occupies all of this land. His timber-framed factory was small, little more than a large shed of about 40 feet by 30 feet, but he retained his AA and RAC listings. It was covered with corrugated iron and ultimately lined with enamel advertising signs. By September 1919 he had completed a prototype motorcycle and he started delivering machines early in 1920. A motorcycle assembler, rather than an outright manufacturer, his machines were built largely out of bought-in components. 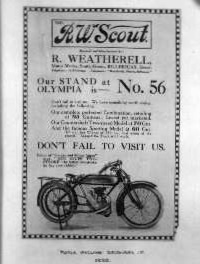 He produced the R W Scout range of lightweight motorcycles, all based on an identical frame, with differing levels of equipment. These machines were fitted with a 316cc two-stroke Dalm engine. Work on an engine of his own design and experiments with a 350cc two-stroke Villiers engine were never completed. The range of prices was from 60 guineas (£63) for a single speed standard model to 95 guineas (almost £100) for a two-speed coach built motorcycle combination. This top of the range model was claimed to be the cheapest lightweight combination then available. A total of four models were offered. Initially his business prospered and by March 1921 he was planning to quadruple the floor area and increase his output. This extension was proposed so that he could cope with claimed orders for 500 machines. But there were indications that his motorcycle combination was not selling since he reduced the price by 20 per cent for two weeks in April. By this time he employed a staff of four with a further four casual salesmen out on the road. Weatherell invested heavily in advertising in most of the motorcycling magazines. He also entered as owner-driver at both of Britain’s major motor racing circuits: Brooklands in Surrey and on the Isle of Man. Then, as now, motor sport was a major means of publicity. In his one appearance at Brooklands in a 500-mile race in 1921, he set a class lap record of 63mph on a racing version of a R W Scout machine. 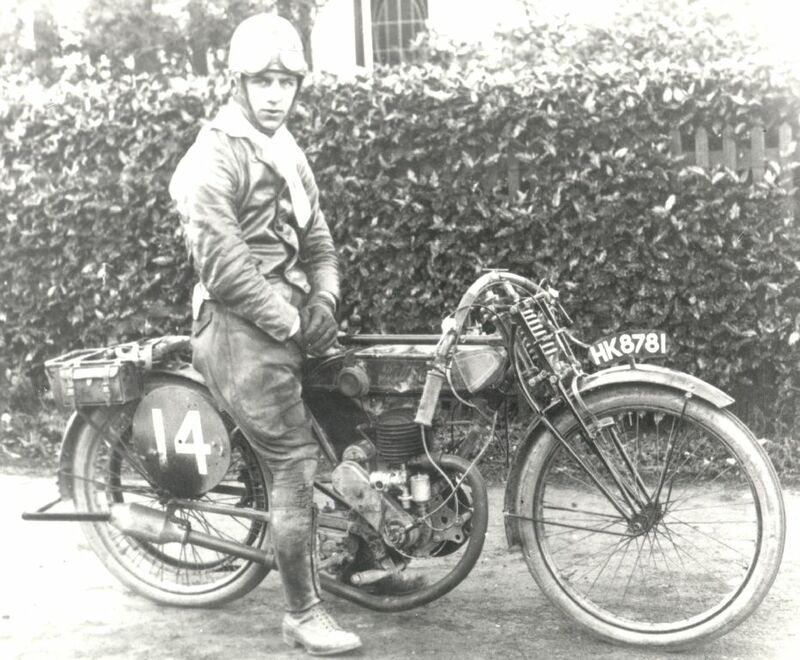 In the 1921 Isle of Man Junior TT, for machines under 500cc capacity, he was forced to retire on the first 37-mile lap with engine problems. He also exhibited in the 1920 Motorcycle Show held at Olympia in December. In April 1921 he attempted to form a company to take over the business, parting with £100 to a trustee to make the necessary arrangements. This attempt to rescue his business, which was not showing sufficient return on the capital invested, failed and Weatherell began an action to recover his £100 plus damages. Shortly after this, when one of his creditors obtained a judgment against him, he was forced to file for bankruptcy. A bankruptcy sale was held at his works in August 1921. Since it consisted mainly of parts suitable for his machines claimed assets of £2,237 realized only £456. A small dividend was paid and a discharge was granted on condition that he consented to a judgment of £100. At the resulting bankruptcy hearing, in Chelmsford held in September 1921, he claimed that he was not bankrupt since his assets exceeded his liabilities. He further stated that he hoped to pay his creditors in full once the value of his assets was realized. A serious accusation that he attempted to bribe a bailiff to set fire to his premises in order to make an insurance claim was strongly denied. An application for a discharge from bankruptcy at a hearing in Chelmsford County Court in May 1922 ended his association with Billericay. R Weatherell was now living in Westcliff-on-Sea. He was working at his new company of R Weatherell and Co Ltd, Motor Engineers of Kilburn, earning £260 annually as a director producing a new marque of Weatherell motorcycles. Liabilities of £1,538 were recorded; including £499 owed to his father-in-law. His South Green works, where about 50 machines were produced, was taken over by Cullis and Goodyear. They produced a range of sheet metal products and remained on the site until the 1930s. These premises then became a garage. It was pulled down to make way for a house in the 1950s. In 1987 this house was demolished to make way for Allington Court, a retirement/sheltered housing complex. 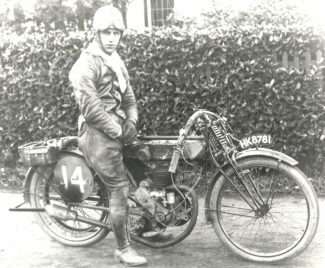 Maintaining his interest in motorsport he entered his motorcycles in races until September 1923, when bankruptcy forced him to leave his mount behind on the Isle of Man. He then resorted to dealing in cars and motorcycles. Keen to try out new ideas he patented a baby-walker with a walking stick handle in 1926. By 1931 he had taken up power boat racing, winning the International Outboard World’s Championship. In court the lawyers attempted to blacken the character of both parties; while they both claimed that they had been victims of mutual sexual advances. Ursula denied that she had sexual relationships with him. The hearing lasted three days. After deliberating for only fifteen minutes the jury, returned to find in Ursula’s favour. She applied for bankruptcy against Weatherell in August 1935. In 1948 he was clearly having continuing financial problems, being only able to pay his creditors small amounts. He died in April 1963. Despite his bankruptcies his finances clearly improved since he left £44,119 to his wife and daughter, the equivalent of nearly £800,000 in 2016. Original research by Ian Fuller with details of his later life from the Kilburn History website.